They walk, they exercise, they walk, they exercise, and they laugh. Miles from a gym or park, members of the Mud River Volunteer Fire Department in rural est Virginia firefighters are taking charge of their own health. Click here for the original Gazette pages, with all photos and charts. 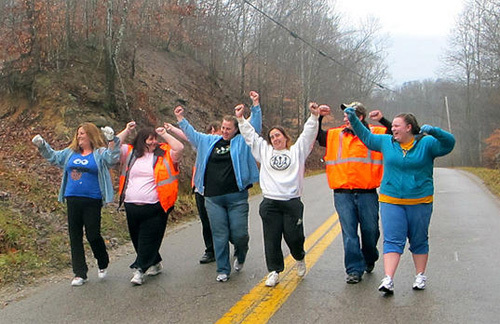 ALKOL, W.Va. — In the chilly dark, Karen, Annie, Melisa, Michele and Shannon are striding down the middle of a twisting country road, a half-hour from any four-lane. Overhead, Lincoln County stars shine bright. They’re laughing and teasing with their friends, telling stories. They feel good. They have lost an average of 71 pounds a person since June. A hound barks. Karen Harris points out a constellation. By 8:30 a.m. they’ll walk four miles on the little-traveled road. Reflective stripes on their Mud River Volunteer Fire Department jackets glow, bobbing in the dark as they walk up the hill. “People see stripes floating, they know it’s us,” Melisa Ferrell says. “Car coming!” Shannon Hager hollers. Everyone moves to the right, careful not to fall into the ditch. The driver waves. “Keep it up!” he yells, giving a thumbs-up. “People out here know what we’re doing,” Annie Toney said. These are tough, tender women, EMTs and firefighters. They go into burning buildings and rescue people who have heart attacks up hollows. They cook chicken dinners for the community when the power goes off. They raise kids. When the Fire Department floods, they clean it up. They have no YWCA, no track, no sidewalks, no gyms. They do have doctors who told them they had high risk of diabetes and heart attacks. They’ve been walking isolated Bulgar Road five mornings a week since June, whoever shows up. In the evenings, five days a week, at 5 p.m., they’re back at the fire hall, pounding donated exercise machines beside the fire engines, dancing in front of the big-screen TV to Richard Simmons and country music DVDs they got on eBay. They’re serious. She’s lost 112 pounds so far, down from 368. Her cholesterol is normal now. Karen Harris and Annie Toney already finished work for the day. They work night shift security at the big Hobet mine. They got off at 4 a.m. Single mothers, they both support their kids. They walk on in silence. Their four miles will take them past crowing roosters and barking dogs and bleating goats and people stirring in their houses and trailers. They’ll laugh most of the way. “This is the best part of my day,” somebody says. The hoses froze up once they got up to the fire, she said, and “I had icicles hanging in my hair.” Everyone laughs. They’ve been there. Once she squeezed through the window of an overturned car to reach a woman trapped inside, she says. “I kept her calm till the Jaws of Life got there,” she said. She has lost 52 pounds since June. “I don’t have sugar anymore,” she says. “My blood sugar’s normal now. The doctors took me off my medicine. They were amazed. Most of them smoke. “We know that’s not good, but one thing at a time,” they say. Five evenings a week for two hours they go at it in the fire station. “The fire hall makes all this possible,” she said. “People heard what we were doing and donated exercise machines. We bought exercise DVDs on eBay. Everyone’s welcome. “People come and go,” Karen Harris said. There are eight regulars, including Melisa Ferrell’s husband and son and Karen’s daughter. They weigh in every few weeks. By their records, they have shed 416 pounds between June and January. “There’s diabetes all over my family, and I don’t want it,” says Shannon Hager. As of Feb. 1, she’d lost 55 pounds. Kevin Ferrell, Melisa’s husband, a diabetic, can’t walk the road since he got hit by a car while trying to help get people out of a wreck. He has a steel rod in his leg. With limited workouts, he’s lost 17 pounds. Melisa’s son, R.J., baby-sits the women’s kids while they work out. “He’s lost 30 pounds just chasing the kids,” Melisa said. Karen’s 14-year-old daughter, Ashley, works out with them in the evenings after school. She’s lost 12 pounds so far. An honor student, she wants to be a pediatrician. Streaks of dawn light the ridgelines. The walkers stand at the top of a hill, quiet, looking down at the valley where a mean dog lives, right before the road starts up a steep hill. “I fit into a size-6 jeans yesterday,” Michele says. “I’m down from a size 14. Somebody tells her to tie a rope around her pants like the “Beverly Hillbillies.” They laugh and start down the hill. “Better get your Moses stick ready, Melisa,” Annie says. Melisa keeps a big stick hidden in a ditch before the mean dog’s house. She finds it. When the dog runs out, snarling and snapping, she shakes her Moses stick at him while the others file past, up the steep hill. They get paid nothing for that. Given the stress in their lives, why do they do it? “For the community,” Karen says, in a tone that makes it clear she wonders why anyone would ask such a question. On the surface, people who study prevention of chronic disease might not give these women much chance of beating diabetes: They don’t have college degrees or middle-class salaries. They have no sidewalks, running tracks or gyms. The nearest grocery store is 20 minutes away if you drive fast. Yet so far they’re beating the odds, partly because they believe they can. The most powerful thing they have may be each other. Research says people who have friends who are trying to get healthy or lose weight have a much better chance of doing the same themselves. This entry was posted in Diabetes, Obesity/ chronic disease, Stories about community programs, Stories about individuals, Stories that illustrate research, Video and tagged Video. Bookmark the permalink. Children at risk identified, but who follows up? What happened? When / how / why did W.Va. pack on the pounds? / A look back in history. Rocking the gym at 7:30 AM. Wood school gets kids fit before they sit. Nebraska school district slims kids by 13 percent / Can West Virginia schools do it too? EDITORIAL: When kids are active, they do better in school, period. The bumpy road to nutritious school food / The Kanawha food fight and Jamie Oliver: What can be learned? American Diabetes Association is MIA in W.Va. Looking for diabetes education? A list of diabetes self-management services in W.Va.